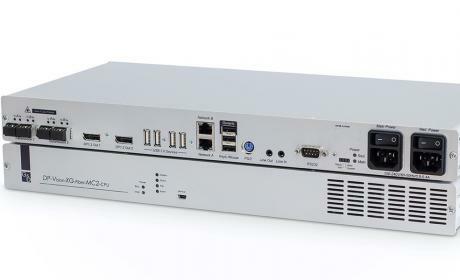 The DisplayPort™ KVM extender system DP1.2-VisionXG consists of a computer module (transmitter) and a user module (receiver) and facilitates the remote operation of one computer. At each module, a console can be connected.For the perfect hand eye coordination, the latency free transmission takes place over fiber. Uncompressed, pixel perfect and lossless up to400 m over a pair of multimode fibers (50/125 µm, 4.700 MHz*km, OM4)10,000 m over a pair of singlemode fiber (9/125 µm, 2,000 MHz*km, OS1). Requires a Computer Transmitter module and a User Console module to function. With its network port, the web interface and monitoring functions, syslog and SNMP, the DP1.2-VisionXG system offers important features for mission-critical applications.